Regrow body parts: Bioelectricity to regenerate limbs in frogs, worms, and possibly people. Flatworms can regenerate entire heads—complete with memories. 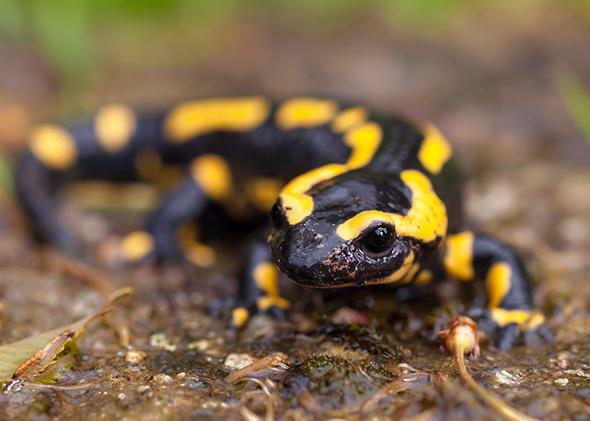 Salamanders, like this one from France, can regenerate their legs. Lizards and tadpoles can regenerate lost limbs—so why can’t we? Michael Levin, director of the Center for Regenerative and Developmental Biology at Tufts, told me why he thinks bioelectricity can do just that. A number of animals can regrow lost limbs. If a predator catches a lizard by the tail, for example, it will often end up with just the tail as the lizard scurries off. To escape, lizards can shed their tails on purpose, and they also have a remarkable ability to regrow them. Some insects, such as cockroaches, can regenerate their legs, as can salamanders, starfish, and lobsters. Zebrafish fins are also a popular model of regeneration, since they regrow after amputation. Interestingly, zebrafish also have a limited capacity to regenerate their hearts. Deer regenerate their antlers—regrowing huge amounts of bone, nerve, and skin every year. When something is regenerated, is it exactly the same as the lost part? Sometimes, but not always. Salamander limbs, for example, can regenerate completely, while tadpole tails are very good structurally but are missing a few nerve types. Perhaps the champions are Planaria flatworms. Their regeneration is perfect; they can regrow every part of their body—including their head. In fact, in a recent study we showed that Planaria flatworms regenerate their heads complete with information they learned prior to decapitation! You have also triggered the regrowth of legs in young frogs. How did you do it? A few years back my lab investigated the bioelectrical signals—the change in the distribution of cells’ resting potentials within a tissue or organ—that allow young tadpoles to regenerate their tails. We found that two components were required on the surface of cells in a wound to set up a bioelectric state that allows regeneration: a proton pump, which pumps hydrogen ions out of the cell surface, and a specific sodium channel, which allows sodium ions to flow across the cell membrane. This bioelectric state was crucial for cells to multiply enough to rebuild the structure, for regeneration-specific genes to be turned on, and for nerves to develop in the direction of new growth. How were you able to recreate this crucial bioelectric state in older tadpoles and frogs? The idea is to trigger a “leg-building module.” Our data over the last decade suggest that such modules are encoded in the pattern of cells’ resting potentials across the tissues of the body—this pattern is what determines which tissues and organs are made and where. First we used gene therapy to introduce a proton pump from yeast to induce the regenerative bioelectric state in older tadpoles, which can’t normally regrow their tails. This forced the regeneration of functional tails, complete with spinal cord. We then created a drug cocktail that induced this same state without gene therapy. When we gave the drug cocktail to froglets it worked, inducing the regeneration of hind legs. Can we apply what we learn about regrowth in other animals to humans? Humans and simpler animals share most cell biology pathways, including the pattern formation mechanisms—the basic step-by-step processes—needed to regenerate complex organs. The basic mechanisms of bioelectrical control are likely similar as well. Since the German physiologist Emil du Bois-Reymond first used a galvanometer to measure currents in human skin and wounds in 1843, they have been studied in hundreds of experiments with animals. These currents have important roles in wound healing. Our recent work on human adult stem cells, in collaboration with David Kaplan’s bioengineering lab here at Tufts, showed that the resting potentials across the cell surface can control how they differentiate into other types of cells. But the real power of this approach isn’t in the control of single cells, but in understanding how bioelectric conversations among large groups of cells direct the growth of complex structures. So, in principle, one day it will be possible to regrow human limbs. What do we need to accomplish that? We need two things. First, we need to crack the bioelectric code—to figure out how patterns of bioelectrical gradients map to the creation of specific organs. We have recently shown that we can reprogram just about any region in the frog embryo into a complete eye. We have also reprogrammed posterior flatworm tissue into complete heads. But this is just the tip of the iceberg; we are only beginning to understand which signals indicate the geometric arrangement of organs in the body. Our goal now is to understand which bioelectric patterns encode the “make a limb” signal. Second, we need a delivery vehicle—a way to impose the correct bioelectric state onto cells in a wound. One example is the BioDome device made by bioengineers in Kaplan’s lab. This is a wearable bioreactor that creates an aqueous environment like amniotic fluid. Within this we can induce appropriate ion currents—and thus the correct voltage states—in the wound and new tissue. So the road map to eventually being able to regrow human limbs is to first perfect the signaling, then the delivery vehicle. That should someday enable this to be used in serious limb injuries—likely starting with regrowing human hands. Are many researchers working on this type of regeneration? There are still very few people working in this field. Some very good work has been done on the effects of applied electric fields on cell behavior, but the key here is to molecularly understand and control the distribution of natural voltage gradients—these are the control knobs that determine the structure and position of complex organs such as limbs, eyes, the brain, and so on. Most labs are focused on biochemical and mechanical controls of stem cells so they can bioengineer and build organs for transplantation. Of course, even if you could solve all the problems of stem cell biology and turn a stem cell into any desired cell type, you would still have the problem of how to build a complex organ such as a limb. Micromanaging the direct assembly of complex organs from stem cells will be very, very difficult. Bioelectricity can trigger large-scale reprogramming—not just turn single stem cells into different cell types. That’s why I think focusing on a strategy that harnesses what the host organism already knows about how to build its organs is the way to go. If we can harness the potential of this technology, how else might it be used? If we had control over pattern formation, we could induce the repair of any organ damaged by injury, disease, degeneration, cancer, or even aging. For example, Planaria flatworms have no known lifespan limit, as they continuously regenerate tissues that age. Fundamentally, broad control of regeneration is the solution to most problems in biomedicine. Moreover, it will have an immense impact on the economics of societies. We face the unavoidable spiral of treatments needed to prolong the last years of life becoming increasingly more expensive. As each new advance patches up the sinking ship of the ageing body, it makes it that much more expensive for the next advance to keep the person alive. Regeneration could break this cycle by inducing regrowth of healthy organs throughout the lifespan. You have a road map—how long do you think it will take us to get there? I can’t make a solid guess about when—it all depends on how the science goes and, of course, how the funding for this expensive research goes. But I think that experiments in animals like frogs will allow us and others to finally crack the bioelectric code and understand how cell groups can store a geometric “memory,” or template of the organs they are supposed to become. Once we learn to speak this bioelectrical language, we will be able to take advantage of it and induce regeneration as needed. And these same signals will be capitalized upon in synthetic bioengineering as we not only repair natural organs, but use bioelectrical shape control to make new hybrid structures—biobots—to desired specifications. I am not certain when or how we will be able to overcome the challenges to get the technique into medicine. But as to the approach as a whole—I’m very optimistic.